Promotion of an e-commerce website can benefit from many general strategies of Web marketing. This means that many of the general principles of promotion of an e-commerce website that apply to promote a generic website, can also be applied to promote your e-commerce project. For example, if we want to evaluate some of the most common strategies, we can see a generic guide introduction to the principles of marketing, like this. In addition to these tips, generally, still it worthy to summarize the most important strategies for your own business, promotion of an e-commerce website for one particular website can not practical without personal consultation by an expert, best by a panel of experts. The SEO or the practice of Search Engine Optimization, is a popular concept now. All those who work on the Web probably know of we are speaking about. In some cases the implementation of a good plan SEO is very complicated matter. Let us try to summarize the main points, explaining how in reality it is a fairly simple concept. When we publish a web page, even if you do not point out to any search engine, after a while, this will be achieved by the so-called search engine robots. These are programs that scan the webpage so as to identify the keywords that characterize it. For example, if we sell novels, most likely the words “novel, fiction, book” will be considered as significant keywords of your page, as it will be recognized as recurring and dominant than the other words. When this happens we say that the page has been indexed. The practical effect of indexing is that, when a user writes one of the words “novel, fiction, book” into the search engine, the page will appear in our search results. Another aspect concerns the popularity (or rank) of the page. Consider two online stores that sell both books, so most likely both will be indexed to the words “novel, fiction, book”. This means that both stores will be between the results of a search that contains one of these words. But what store will appear first in the search results page? The answer is: it appears before the store’s most popular or the one with a higher rank. We understand that it is not enough to be indexed, but it is equally important to obtain a high score rank. To increase the page rank we can adopt two main strategies. Adding meaningful content to the page. Staying in the case of books, that does not mean trivially repeat the word “novel” a few dozen times on the page, because the robots are smart enough to know when a keyword is used to increase the abundance of its recurrence. If we want our keywords are recognized as valid we have to insert meaningful content, i.e. by repeating the keywords in the description of the product, or the answers to the users, in the pages of presentation, in the promotion, in the articles like blogs, etc. Obtain a greater number of links to your site. With the increase of links pointing to our page consequently increases the rank of the same. It is therefore important to remember to add a link to your e-commerce site as often as possible : signature of the mail, printed advertising material, signs of the responses to blogs, etc. Strategies of this type fall within the Web marketing general, as already mentioned in the opening part The optimization of SEO is an activity quite simple, but it consumes a lot of time and resources. It is for this reason that it is often convenient to rely on a service provided by experts in the field : not because it is impossible to “do it yourself”, but rather because it worth it. I do know I am more intelligent to get a good link if I work for this website. But it is not possible for me to waste time behind finding the ways, implementation etc. In that time, I can write an article. Knowing the basics of SEO has importance – for small personal non-profit website, we can do it ourselves. The results that an expert is able to obtain result within 2-3 days of work which could cost us a few weeks by buying and reading some e-books. The Pay Per Click campaigns are a very affordable way to promote your website. One of the most popular is AdWords from Google. The concept is simple: instead of paying for advertising in fixed rate, we are asked to pay only when users are actually clicking on our advertisements or when they are re-directed to our site. In this way, for example, if our advertising would be displayed from 1000 users per day, but only 10 of these came by clicking on advertising, we would be charged only 10 clicks plus some minimal extra for other things if set. Apparently you might think that the system allows to make themselves known to the public with a minimum spend. In fact, a lot depends on what keywords we want to associate our advertising. 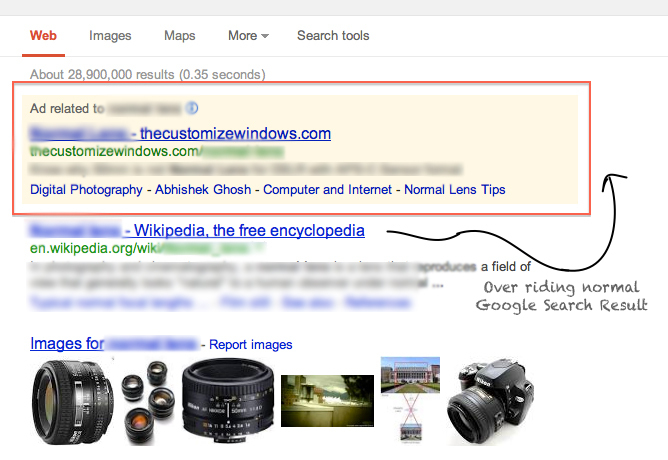 For example, AdWords ads are displayed as advertising as a result of research conducted on Google. After the user has entered the keyword research, in addition to the normal results of AdWords ads are displayed. Depending on the type of products offered to the public we must choose the most appropriate social network. The options are many: if we consider only the most popular channels we can choose between Facebook, Google+, Twitter, LinkedIn, etc.. In fact, the list is very long, but with a little research could discover the social network that does just the job. In some cases, a social network less popular, but more relevant to the type of our products could be a winning choice compared to a social network of a general nature. In case of Facebook, LinkedIn; we can use Ads on those specific Social networks to increase engagement, like increase likes Naturally by promoting. Do not ‘buy’ Likes, Followers etc. as it is proven to be bad in long term, instead use official Ads. This Article Has Been Shared 8286 Times! Google Consumer Surveys Review openly discusses the plus and minus points as a paid industry’s standard Survey and clearly shows the benefits for your business. Outgoing Link Tracking with Google Analytics is quite easy to setup both with the traditional or the asynchronous code. You can track outgoing certain link. Just like getting new visitors from the search engine, catching and keeping up these new visitors also needs some thought. Here are some elaborations of the facts. Cite this article as: Abhishek Ghosh, "Promotion of an e-commerce website you own," in The Customize Windows, May 26, 2013, April 21, 2019, https://thecustomizewindows.com/2013/05/promotion-of-an-e-commerce-website-you-own/.